FILE - German Chancellor Angela Merkel and Ukrainian President Petro Poroshenko adress the media after a meeting at the German government guesthouse Meseberg Palace in Meseberg, May 20, 2017. German Chancellor Angela Merkel remains committed to strong trans-Atlantic relations, her spokesman said Monday, after the German leader suggested that the United States is no longer a reliable partner. "Because trans-Atlantic relations are so important to this chancellor, it is right from her viewpoint to speak out honestly about differences," spokesman Steffen Seibert said Monday during a news conference. "The times in which we can fully count on others are somewhat over, as I have experienced in the past few days," Merkel said, addressing a campaign rally in Bavaria. 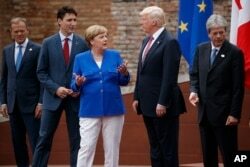 Merkel, among other European leaders, was sharply critical of U.S. President Donald Trump's decision at the recent G-7 meeting in Sicily not to reiterate support for the 2015 Paris agreement to combat climate change. In a pared down final communique, all G-7 nations except the U.S. pledged action to mitigate climate change. Merkel has said the climate agreement is so important there should not be any compromise on it.